Affiliated with the Korean Society of Hypertension, Clinical Hypertension publishes in all areas of hypertension, pulmonary hypertension and vascular disorders including vascular biology, pharmacology, pediatric hypertension and imaging. 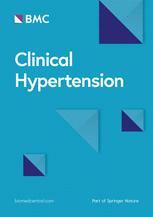 Articles published in Clinical Hypertension also encompass other disciplines such as neuroscience, endocrinology, nephrology, rheumatology and nursing. Our expert Editorial Board welcomes submissions from across our subject area, and we pride ourselves on providing a swift editorial response.